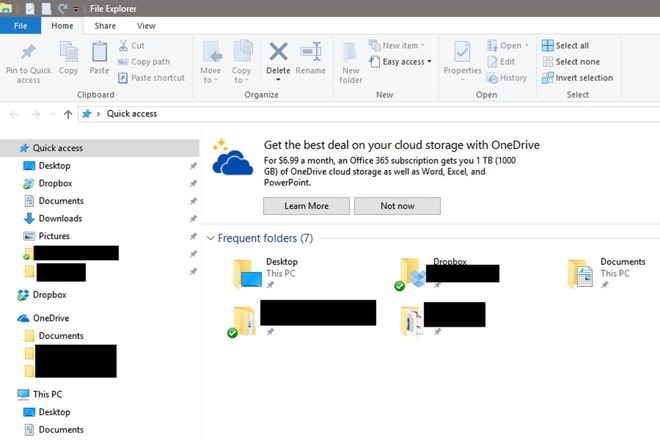 Microsoft continues aggressively promoting its own services in Task Bar notifications when using third party browsers, and most recently has been caught injecting advertisements to sign up for paid OneDrive subscriptions in the Windows 10 —but the File Explorer ad can be disabled. Screen capture: Reddit user "Tall_Ships_For_Life"
Continuing a trend set by persistent nags, and forced migrations to Windows 10, Microsoft started the File Explorer notifications earlier in March. The advertisement for the paid service pops up in the Quick Access screen when File Explorer is opened, even without looking for a network share to store files. "The new tips notifications within the File Explorer in Windows 10 were designed to help Windows 10 customers by providing quick, easy information to enhance the experience relative to storage and cloud file management," a spokesperson said in a statement provided to AppleInsider. "That said, with Windows 10 customers can easily opt out of receiving these notifications if they choose." Why this "tip" isn't shunted to the Windows 10 notification center isn't clear. The service inducement appears regardless if the user has paid for a Windows 10 license or not. Windows users can disable the Microsoft service advertisement in the File Explorer, by selecting View, then Options, then clicking on Change folder and search options. In the window that pops up, select the View tab, scroll to the bottom of the list, and de-select Show sync provider notifications. Click OK to close the window. This setting was automatically re-enabled following a routine OS patch after AppleInsider tested the procedure, so frequent checks may be in order. Tech maven Paul Thurrott notes that given the name of the parameter, that advertisements for other internet-based file storage services may be coming.